The bishop has no restrictions in distance for each move, but is limited to diagonal movement. Bishops, like all other pieces except the knight, cannot jump over other pieces. A bishop captures by occupying the square on which an enemy piece sits. The bishops may be differentiated according to which wing they begin on, i.e. the king's bishop and queen's bishop. As a consequence of its diagonal movement, each bishop always remains on either the white or black squares, and so it is also common to refer to them as light-squared or dark-squared bishops. Initial placement of the bishops. The bishop's predecessor in shatranj (medieval chess) was the alfil, meaning the elephant, which could leap two squares along any diagonal, and could jump over an intervening piece. As a consequence, each fil was restricted to eight squares, and no fil could attack another. The modern bishop first appeared shortly after 1200 in Courier chess. A piece with this move, called a cocatriz or crocodile, is part of the Grande Acedrex in the game book compiled in 1283 for King Alfonso X of Castile. The game is attributed to "India", then a very vague term. About half a century later Muḥammad ibn Maḥmud al-Āmulī, in his Treasury of the Sciences, describes an expanded form of chess with two pieces moving "like the rook but obliquely". Derivatives of alfil survive in the languages of the two countries where chess were first introduced within Western Europe - Italian (alfiere) and Spanish (alfil). It was known as the aufin in French, or the aufin, alphin, or archer in early English. The term "bishop" first entered the English language in the 16th century, with the first known written example dating back to 1560s. In all other Germanic languages, except for Icelandic, it is called various names, all of which directly translate to English as "runner" or "messenger" (e.g. in Norwegian "Løper", in Danish "Løber", in Swedish "Löpare", in German "Läufer" and in Dutch "loper"; in Finnish, the word is "lähetti", and in Polish, "goniec", both with the same meaning). In Romanian, it is known as "nebun" which refers to a crazy person (similarly to the French name "Fou" (fool) which is most likely derived from "Fou du roi", a jester). In Icelandic, however, it is called "biskup", with the same meaning as in English. Interestingly, the use of the term in Icelandic predates that of the English language, as the first mentioning of "biskup" in Icelandic texts dates back to the early part of the 14th century, while the 12th-century Lewis Chessmen portray the bishop as an unambiguously ecclesiastical figure. In The Saga of Earl Mágus, which was written in Iceland somewhere between 1300-1325, it is described how an emperor was checkmated by a bishop. This has led to some speculations as to the origin of the English use of the term "bishop". The canonical chessmen date back to the Staunton chess set of 1849. The piece's deep groove symbolizes a bishop's (or abbot's) mitre. Some have written that the groove originated from the original form of the piece, an elephant with the groove representing the elephant's tusks (see photo in the history section). The British chose to call the piece a bishop because the projections at the top resembled a mitre. This groove was interpreted differently in different countries as the game moved to Europe; in France, for example, the groove was taken to be a jester's cap, hence in France the bishop is called "fou" (the jester; the word can also mean madman or gannet). In some Slavic languages (e.g. Czech/Slovak) the bishop is called "střelec/strelec", which directly translates to English as a "shooter" meaning an archer, while in others it is still known as "elephant" (e.g. Russian slon). In South Slavic languages it is usually known as "lovac", meaning "hunter", or "laufer", taken from the German name for the same piece (laufer is also alternative Polish name). An alternative name for bishop in Russian is officer (Russian: офицер). The original name of the bishop was "elephant" (i.e. "war elephant"). A rook is generally worth about two pawns more than a bishop (see Chess piece relative value and the exchange). The bishop has access to only half of the squares on the board, whereas all squares of the board are accessible to the rook. On an empty board, a rook always attacks fourteen squares, whereas a bishop attacks no more than thirteen and sometimes as few as seven, depending on how near it is to the center. Also, a king and rook can force checkmate against a lone king, while a king and bishop cannot. In general bishops are approximately equal in strength to knights, but depending on the game situation either may have a distinct advantage. Less experienced players tend to underrate the bishop compared to the knight because the knight can reach all squares and is more adept at forking. More experienced players understand the power of the bishop (Mednis 1990:2). Bishops usually gain in relative strength towards the endgame as more pieces are captured and more open lines become available on which they can operate. A bishop can easily influence both wings simultaneously, whereas a knight is less capable of doing so. In an open endgame, a pair of bishops is decidedly superior to either a bishop and a knight, or two knights. A player possessing a pair of bishops has a strategic weapon in the form of a long-term threat to trade down to an advantageous endgame. Two bishops vs King can force checkmate, whereas two knights cannot. A bishop and knight can force mate, but with far greater difficulty than two bishops. In certain positions a bishop can by itself lose a move (see triangulation and tempo), while a knight can never do so. The bishop is capable of skewering or pinning a piece, while the knight can do neither. A bishop can in some situations hinder a knight from moving. In these situations, the bishop is said to be "dominating" the knight. On the other hand, in the opening and middle game a bishop may be hemmed in by pawns of both players, and thus be inferior to a knight which can hop over them. Furthermore, on a crowded board a knight has many tactical opportunities to fork two enemy pieces. A bishop can fork, but opportunities are more rare. One such example occurs in the position at right, which arises from the Ruy Lopez: 1.e4 e5 2.Nf3 Nc6 3.Bb5 a6 4.Ba4 Nf6 5.0-0 b5 6.Bb3 Be7?! 7.d4 d6 8.c3 Bg4 9.h3!? Bxf3 10.Qxf3 exd4 11.Qg3 g6 12.Bh6! A bishop dominating a knight. An example of a bishop fork occurs after 12...Nxe4?, when the forking 13.Bd5! wins material after, e.g., Nxg3 14.Bxc6+ Qd7 15.Bxd7+ Kxd7 16.fxg3. In the middle game, a player with only one bishop should generally place his pawns on squares of the color that the bishop cannot move to. 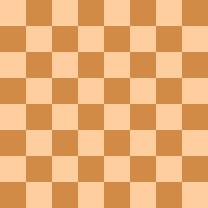 This allows the player to control squares of both colors, allows the bishop to move freely among the pawns, and helps fix enemy pawns on squares on which they can be attacked by the bishop. Such a bishop is often referred to as a "good" bishop. Conversely, a bishop which is impeded by friendly pawns is often referred to as a "bad bishop" (or sometimes, disparagingly, a "tall pawn"). The black light-squared bishop in the French Defense is a notorious example of this concept. However, a "bad" bishop need not always be a weakness, especially if it is outside its own pawn chains. In addition, having a "bad" bishop may be advantageous in an opposite-colored bishops endgame. Even if the bad bishop is passively placed, it may serve a useful defensive function; a well-known quip from GM Mihai Suba is that "Bad bishops protect good pawns." In the position from the game Krasenkow versus Zvjaginsev, a thicket of black pawns hems in Black's bishop on c8, so Black is effectively playing with one piece fewer than White. Although the black pawns also obstruct the white bishop on e2, it has many more attacking possibilities, and thus is a good bishop vis-à-vis Black's bad bishop. Black resigned after another ten moves. A bishop may be fianchettoed, for example after moving the g2 pawn to g3 and the bishop on f1 to g2. This can form a strong defense for the castled king on g1 and the bishop can often exert strong pressure on the long diagonal (here h1-a8). A fianchettoed bishop should generally not be given up lightly, since the resulting holes in the pawn formation may prove to be serious weaknesses, particularly if the king has castled on that side of the board. There are nonetheless some modern opening lines where a fianchettoed bishop is given up for a knight in order to double the opponent's pawns, for example 1.d4 g6 2.c4 Bg7 3.Nc3 c5 4.d5 Bxc3+!? 5.bxc3 f5, a sharp line originated by Roman Dzindzichashvili. Giving up a fianchettoed queen bishop for a knight is usually less problematic. For example, in Karpov-Browne, San Antonio 1972, after 1.c4 c5 2.b3 Nf6 3.Bb2 g6? !, Karpov gave up his fianchettoed bishop with 4.Bxf6! exf6 5.Nc3, doubling Black's pawns and giving him a hole on d5. An endgame in which each player has only one bishop, one controlling the dark squares and the other the light, will often result in a draw even if one player has a pawn or sometimes two more than the other. The players tend to gain control of squares of opposite colors, and a deadlock results. In endgames with same-colored bishops, however, even a positional advantage may be enough to win (Mednis 1990:133-34). Endgames in which each player has only one bishop (and no other pieces besides the king) and the bishops are on opposite colors are often drawn, even when one side has an extra pawn or two. Many of these positions would be a win if the bishops were on the same color. The position from Wolf versus Leonhardt (see diagram), shows an important defensive setup. Black can make no progress, since the white bishop ties the black king to defending the pawn on g4 and it also prevents the advance ...f3+ because it would simply capture the pawn - then either the other pawn is exchanged for the bishop (an immediate draw) or the pawn advances (an easily drawn position). Otherwise the bishop alternates between the squares d1 and e2 (Müller & Lamprecht 2001:118). If two pawns are connected, they normally win if they reach their sixth rank, otherwise the game may be a draw (as above). If two pawns are separated by one file they usually draw, but win if they are farther apart (Fine & Benko 2003:184-204). In an endgame with a bishop, in some cases the bishop is the "wrong bishop", meaning that it is on the wrong color of square for some purpose (usually promoting a pawn). For example, with just a bishop and a rook pawn, if the bishop cannot control the promotion square of the pawn, it is said to be the "wrong bishop" or the pawn is said to be the wrong rook pawn. This results in some positions being drawn (by setting up a fortress) which otherwise would be won.